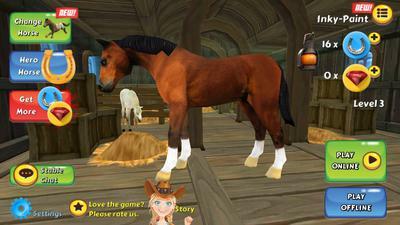 This fun interactive new horse game is a great game to have on your phone. You start off with brown Hanoverian at level 0. But as you complete quests, you gain horseshoes and advance through the levels. There are two different areas to explore at the start of the game, but as you continue to advance in the game more open up. The game is easy to follow and not complicated. I found the navigation a little confusing at first but once I figured it out it was fine. 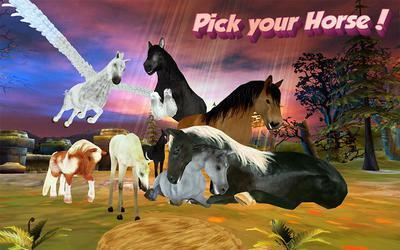 The graphics are fantastic and offer a variety of horses and foals you can choose from as you move up the levels. These include everything from a white Hanoverian to a Pegasus or a Draft, and plenty of quests to complete. These quests range from chasing raccoons to finding keys. The game is fairly realistic as far as the horses go too. By this I mean that the horses can walk, trot, gallop and jump. Plus, they all have energy levels that have to be brought up by hay or forge, or by sleeping. They even have the horses lay down when they are supposed to be sleeping. If you're a horsey person like me, I give them major bonus points for putting in the time and effort to do something realistic and different than I have yet to see another game do. Also, your horse has a complete bio. There you can name your horses, choose their personalities, their favorite foods, their favorite activities etc. This game also allows you to talk with others through chat. I believe this can be avoided, however, if you select the version for children for under thirteen. You can also add friends to your friend list and you and your friends can solve quests together if you have a subscription (see below). My only complaints are that the quests are rather easy and simple, and you have to have to use one of the randomly generated usernames. But the creators of the game said they are creating new features all the time, so this game will get better and better. Some features are only available through subscription which is only $4 a month or $10 for a lifetime subscription. Membership allows you to complete the game hassle free, and gives you 10 horses and a new environment. You can also buy some premium horses like the Pegasus etc using Gems. This game is available for iPhone or android. 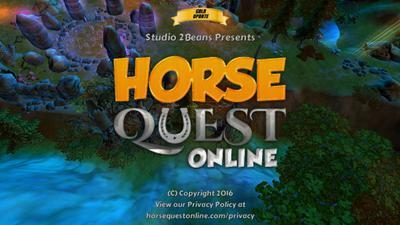 You can download Horse Quest online for free here. Inspired by a HorseCrazy Girl! Here's something else about the game I think is cool: It was created in part by a horsecrazy girl about the same age as me! Dineth has an app development business and his sister Maya is horsecrazy like us. She doesn't have her own horse yet but she rides English on the weekends. She's also into drawing horses and digital art. Dineth and Maya decided to partner up to create a multi-player horse game for mobile, because nothing like that existed at the time. Maya did a lot of the art and design and Dineth's team did the back end stuff in order to get everything to work. It took them about 5 months from start to finish. I love that a horsecrazy girl helped create it! I know you're going to like this game. Please share your comments and tips below. I love this game! Just one problem, I can't get the Hero Horse. It only says I can get Lifetime. I would like to see the subscription for monthly. It also glitches to where the horses can't be seen, I need to go out of the room to let it work again. Please help! I can’t seem to get new quest anymore. I did lifetime membership and still have no access to new quest to level up and unlock bottom area by summer ravens bridge. Am in the crystal garden. Help. We bought the pegasus for £12.58 which cannot fly anymore, the fly option has gone, clearly a glitch. Emailed quest support, they don't reply. I strongly recommend not paying for anything as you wont get support if you need it. This game is great but for some reason I can't see what I said in chat after i typed it...Can other people see it but i can't? Help!!! Let me check with them. What type of device are you playing on? You should let people play this game with no download because I think this is a really cool game. But what if someone's parents wont let them download anything then they wont be able to play this wonderful game. I bought the monthly membership and it gave me the extra land but not the 10 horses. I am confused please help me what do I do? You should contact Horse Quest Online support to clarify the issue. This game is great! But I just wish they would lower the prices and make it easier to get gems. Anyway, if you want to be friends with me on the game my name is untamed-black and lVe 21-23. I love this game! I play it all the time and I know you will love it too! This game is fun at the start, but there is one big problem. You need gems to buy the best horses, but there is only one way to get gems. BUY THEM. With real money. Wow, I love it! I play it like every day. My username on there is Chance-Cadence. I really think this game is awesome! It is really fun to play!!!! The best game ever! I have so much fun playing and talking to people all around the world! I am so lucky to be picked out of the contest and I am very appreciative for it! Anyone and everyone who loves talking or love horses should get this game! It truly is an extraordinary game! AMAZING GAME! I play it everyday! Amazing game! Super fun! I really want the hero horse! I play this game everyday and I highly recommend it to horse lovers! This is such a cute game and I instantly fell in love with it! I played it and I must admit that it was fun to play, there is a lot to it. I love this game! I got it on my mom's iPad about 1 month ago! So fun!